Microscopic image of a fresh-water polyp, Hydra sp. 27 individual images were stacked together to produce one final sharp image. This image nearly crashed my computer – it is a stack of 27 separate images to increase the depth of field. The computer worked nearly an hour on this picture. Without stacking, some of the tentacles would not be in focus. I think that less pictures would have given a similar result. The picture on the right shows the fresh-water polyp Hydra sp. The specimen is about 5mm in length, the picture shows about half of the organism. 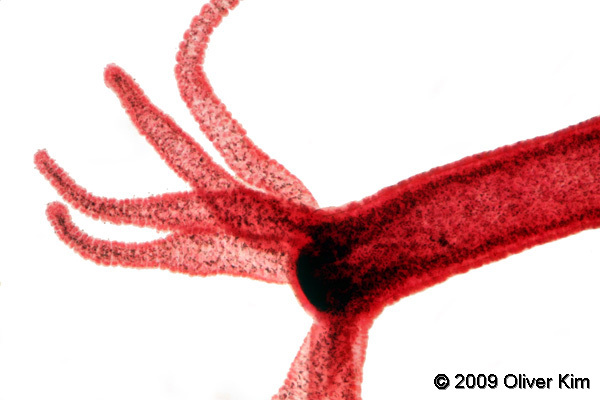 The Hydra belongs to the taxon Cnidaria and is a relative of the sea anemones, corals and jelly fish. Its tentacles are used to catch food. It is sessile, this means that it is attached to a solid surface and does not move. The mouth of the hydra is located towards the left of the image, where the tentacles attach to the body. Hydras are not sessile; far from it. They move by basal gliding like many of their marine cousins or, more often , by looping and somersaulting, attaching oral end and pedal disk alternately. Hydras, especially the green species, are positive to moderate light moving by random movements towards the lighted side of the aquarium. They are negative to bright light and move away from the light. Have a Hydra culture in your classroom ? Get the kids to design an experiment to test this statement and see for themselves. to add- they will also continue to live even if cut in half as will parts grow into whole if cut.